Even though the 2016 wasn't maybe the best for the world, to me personally it was a good year. I'm very grateful for the adventures and possibilities I've had. I met new people, made new friends and kept keeping workshops in Finland but also abroad. Thank you for every one who attended and made them possible! It was a true pleasure to meet you all! During the year I was honored to be able to continue designing for Prima Marketing and 7 Dots Studio, two of my favorite brands. 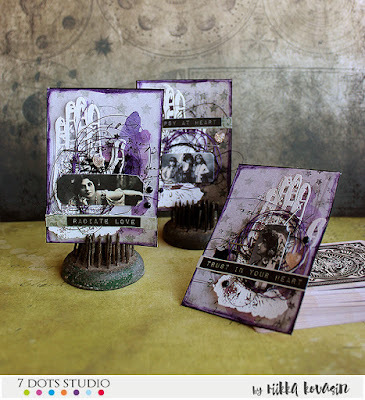 I love especially the variety of different mediums Prima has and I just adore the quality and design of the 7 Dots Studio papers. I also continued to design for A Flair for Buttons a lovely Etsy store selling wonderful flair buttons which you might noticed from my workshop kits. 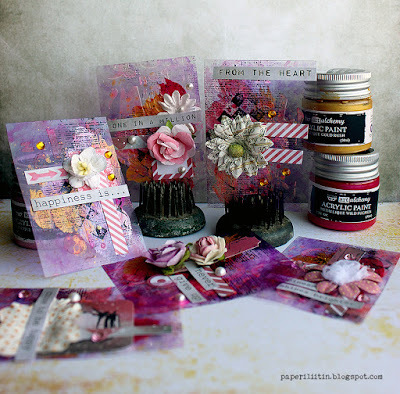 I also designed for Artists Live, an Ustream show happening each Monday and ScrapFX, an Australian chipboard company, both of witch I needed to leave because of time issues connected to my new job. 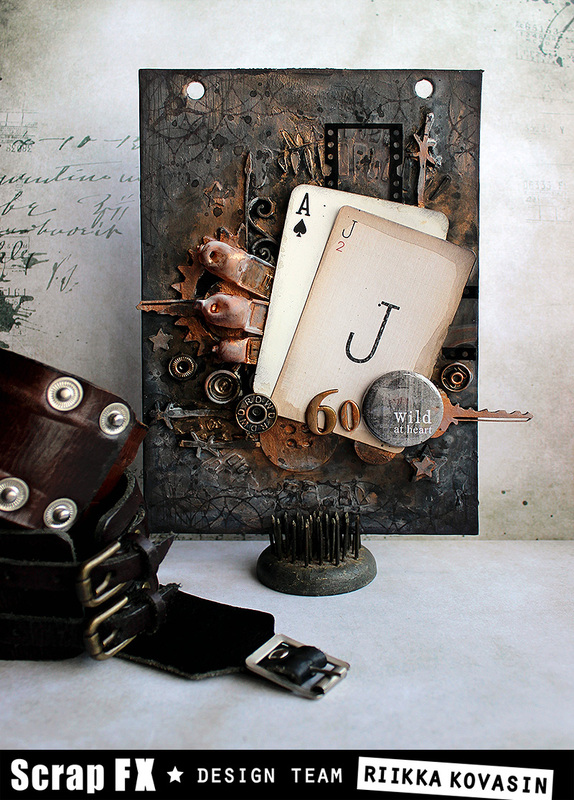 During the beginning of the year I also was a part of the Mixed Media Place's design team. One of the highlights of the year was a new team I got invited, being a Finnabair Brand Ambassador. I'm so honored to be part of the team and truly adore the wonderful variety of mediums and embellishments. 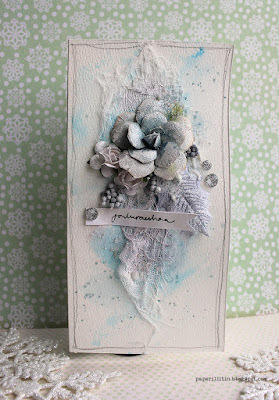 Other highlight was the CreativeWorld craft fair, where I was demoing on the Prima booth. I'm also very grateful for the splendid guest opportunities I had throughout the year. I guested in a couple of challenges, Scrap The Girls and CSI, some manufactures, Wow! 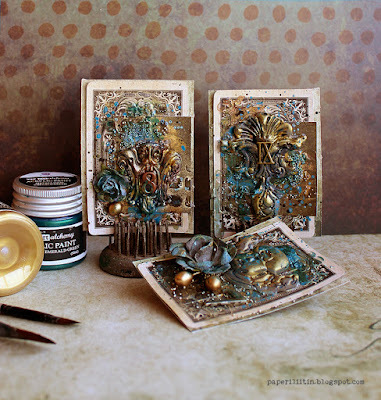 Embossing Powders, Elizabeth Craft Designs and Broucek. Wow! 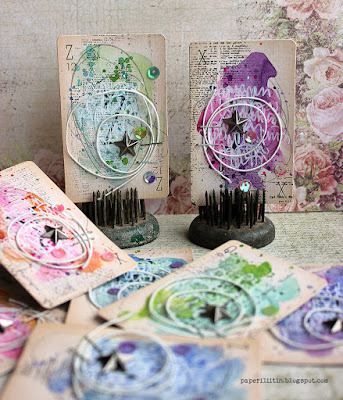 powders are something I use regularly, so it was a pleasure to do a guest post for them. Broucek was a brand I got introduced to during Frankfurt fair. 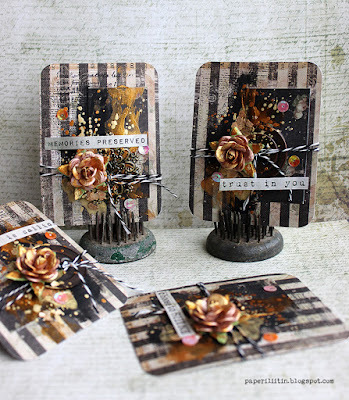 For Elizabeth Craft Designs I had the pleasure of doing a couple of guest crafts. Even more what makes my heart flutter is all the projects and articles that were published through the year. 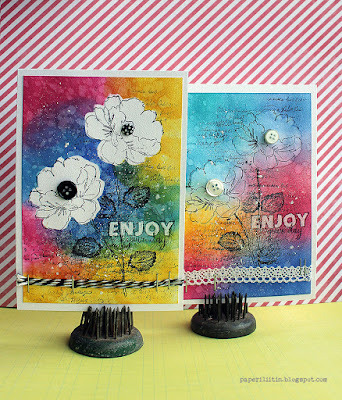 Thank you Craft Stamper, Ihana, Creative Magazine, Histoires de Pages and Mixed Up for these opportunities. You can see the complete list of the publications in my "Resume" page if you are interested (link). I'm also grateful for all the followers in my social media sites - Facebook, Instagram and Twitter. It's wonderful to see new faces joining in and following. Thank you for that! The social media sites also provide a fun place to share some shots from "behind the scenes" so to say and little sneak peeks of projects I'm doing. During the year I also continued to do videos of my projects, you can see them all in my YouTube channel (link). The Artists Live show recordings are on the Artists Live YouTube channel, though (link). I'm doing four posts totally. 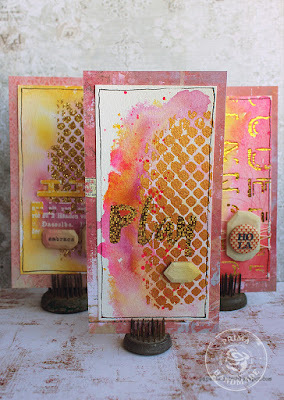 In this post I'm sharing my favorite card-like projects of the 2016. There's ATCs and cards as I've not done that many cards during the year but quite a few sets of ATCs. What also changed compared to previous years, that I made a lot less canvases during 2016. Instead I made quite a few altered projects and other projects not directly connected to paper crafts. In that way the repertoire got a lot bigger or wider this year. Naturally I also continued to make scrapbooking layouts. I'm sharing my favorites of the layouts on the second post. 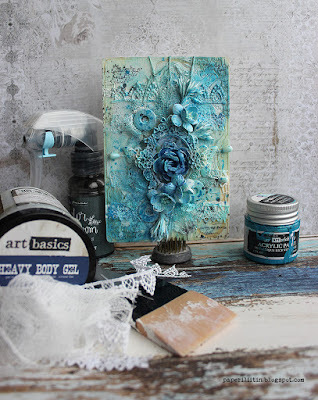 The third and fourth post shall be about sharing my 12 favorite journaling and canvas projects in one post and the last one is dedicated to altered items and special projects. Listing my personal favorites is something I've done a couple of years now. Here you can see my favorite cards of 2015 (link), of 2014 (link) and also 2013 (link). So without further ado, here's my personal favorites of cards and ATCs of 2016. I've included a link to the original post if you want to see more pictures or read more about the project. I've mentioned if there's a tutorial or a video in the original post. Thank you for stopping by today! Wishing you creative and artful 2017! 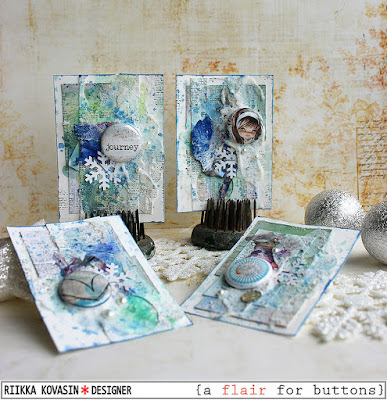 So much great inspiration from you the past year Riikka! 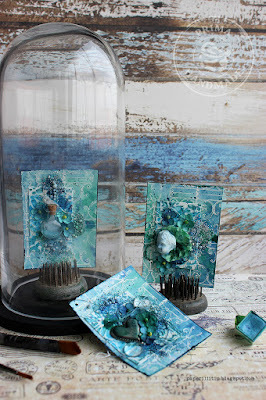 I love everything you do - that you already know - and I am so happy that some of your ATC´s has found their way into my home - they are now treaured items on display! I wish you a good 2017 - and hope that we will have the chance to meet again during this year! HUGS!